A low growing ornamental banksia from SW Western Australia near Ravensthorpe. 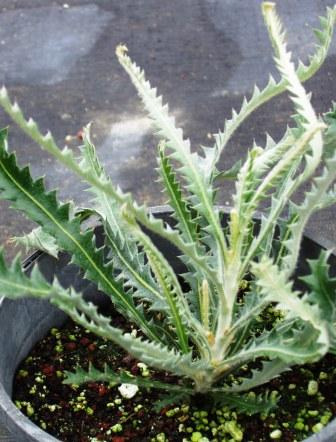 Not commonly grown but is unusual in that it is a small banksia shrub with with deeply serrated leaves and yellow flower-heads. Can be grown as a low hedge or screen or as an unusual container plant. Propagation Information: Seed germinates readily if available. Drench seed with a fungicide after sowing to prevent "damping off". Sow in 3:1 Perlite:Peat.